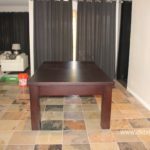 Our local Orange County customers were in search of a pool table that converts to a dining table for their vacation home they bought from twiddy in Rancho Mirage, California. 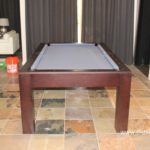 They chose the elegant (yet affordable) Peyton Dining Billiard combo with bankers gray felt. The Peyton is available in 7′ or 8′ and is a great option for homes that don’t have a dedicated game room space. Four leaves hide the three piece slate playing field and are easily removed when it is time to play. Its contemporary, Parsons-like design, keeps leather bucket pockets hidden when in dining mode. Visit our pool table showroom to find the right billiard table for your home and budget. Our entire lineup can be viewed on our website. Once you pick out your favorite, we can deliver and professionally install it to playing perfection. 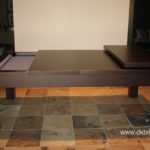 I’m interested in a decent combination dining/pool table. Apx 7′ in length. Do you provide delivery and set up?